Just like there are advantages of becoming a trucker there are also disadvantages of becoming a truck driver just like any other profession. The nature of most of these disadvantages however, will have a lot to do with your individual situation and attitude prior to becoming a driver. I hear a lot of guys complaining out here. There are a lot of common things among the complaints but a lot of it has to do with jumping into trucking without asking questions, not knowing the right questions to ask or not taking the time to really think about the realities of trucking life. Frankly, one of the biggest issues are you being fed false information by recruiters to get you behind the wheel of the trucking company. So I'm glad you're here. These realities about trucking jobs could be an advantage to some and a disadvantage for others. 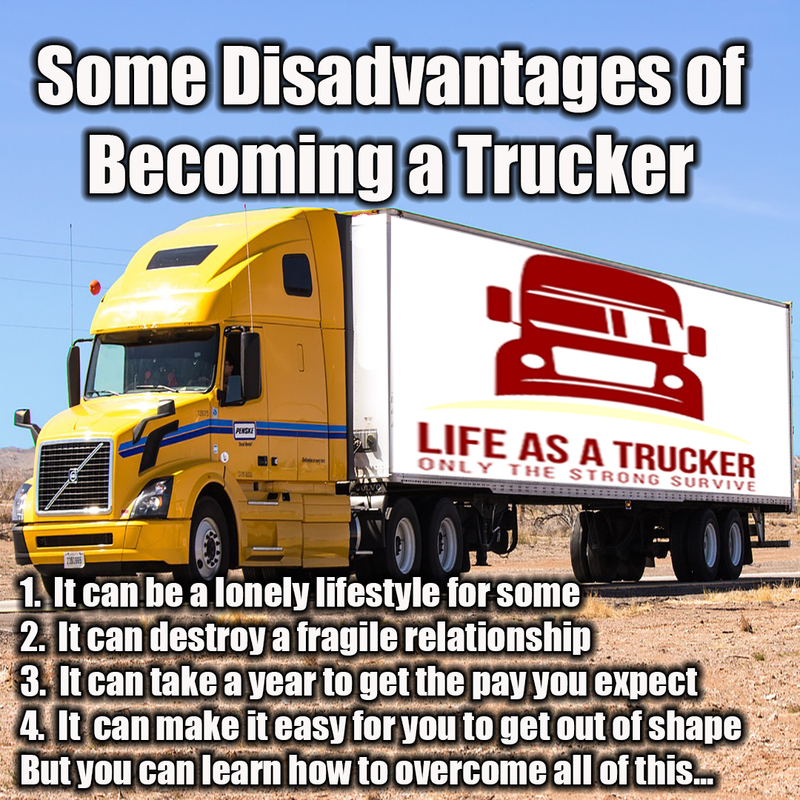 Click each disadvantage of becoming a trucker below to get details and ways to turn that disadvantage around or make it less of a problem. Don't get discouraged because of what you see on the lists, rather think through it through and apply it to your scenario. It may be neither an advantage nor a disadvantage in your case. Also, by looking at these potential disadvantages now you can keep them from becoming an issue for you by considering the advice given. Because you can decide that you are not compatible for the trucking lifestyle or you can decide how you can cope/overcome the challenges. Before choosing a trucker's life consider these things . . .
Have a game plan about what this experience is going to look like so that both of you are on the same page. Map out the journey as best as you can for long term and the next 5 years. For example, is this a career move or just temporary? If it is temporary, then what is temporary, 5 years or 10? Also, what will you being doing in the mean time to guarantee a successful transition out of the truck or away from OTR. These things may seem a little obvious to you at first, truth is, I think some of these may be so obvious that people don't think about them as disadvantages of being a truck driver. (That's when they are the biggest disadvantage.) Because of your awareness, you can overcome these for the most part and keep them from affecting you. Good Job! I know just because you are smart enough to read all of this like your doing, that you will do just fine when deciding whether to drive or not. You are the type of person that will make a good driver if you drive. If you decide not to drive you will do a good job at what ever else you decide to do. That's Why I congratulate you. I say again, "Good Job for doing your research. Now get back to reading!" :-) p.s. there may be more disadvantages of becoming a trucker that I haven't thought of yet so you know I will be adding more as they come to mind. I need my professional drivers to jump in and gives us some disadvantages you see from being a truck driver. I hear a lot of guys complaining out here. There are a lot of common things among the complaints but a lot of it has to do with jumping into trucking without asking questions or not taking the time to really think about the realities of trucking life.